The ban will extend a 2013 partial ban of three neonicotinoids – Bayer’s imidacloprid and clothianidin, and Syngenta’s thiamethoxam – to cover all open-field uses, but allows their use in permanent greenhouses . Research indicates that several other insecticides are a threat to bees and other beneficial insects, including four neonicotinoids currently authorised in the EU – acetamiprid, thiacloprid, sulfoxaflor and flupyradifurone – and other insecticides, like cypermethrin, deltamethrin and chlorpyrifos. dramatically reduce the use of synthetic pesticides and support the transition to ecological methods of pest control. 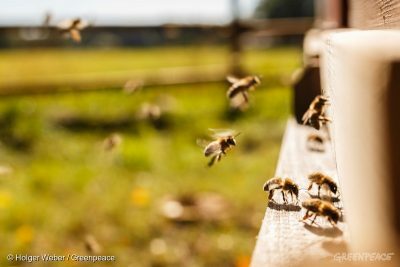 The ban says that “[EU] Member States must pay particular attention to […] the exposure of bees via the consumption of contaminated water from the permanent greenhouses”, but recommends no restriction. However, scientific evidence shows that neonicotinoids leach into the soil around greenhouses, contaminating watercourses and threatening bees. Neonicotinoids will be banned in France from 1 September 2018 onwards, with certain uses allowed until 1 July 2020. The ban covers the three chemicals already restricted at EU level, as well as acetamiprid and thiacloprid. It may also include sulfoxaflor and flupyradifurone, depending on the outcome of ongoing discussions. EFSA has applied a more comprehensive approach in its latest assessments of the risks chemicals pose to bees. The Commission has proposed using this method for all pesticide risk assessments, but European governments are yet to agree.